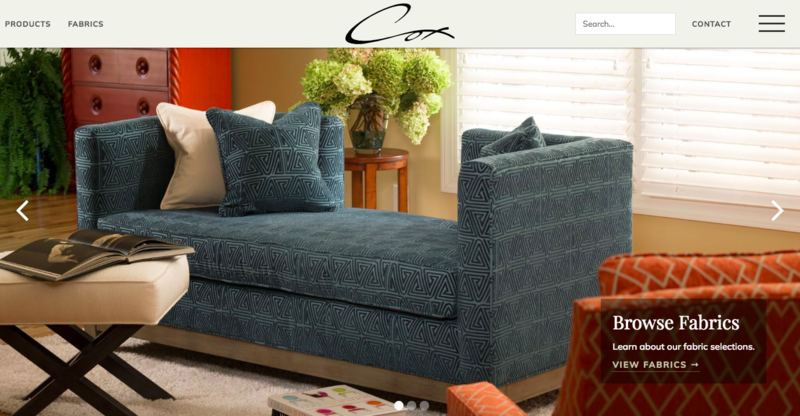 Hickory-based upholstery leader, Cox Manufacturing Company, teamed with VanNoppen Marketing to design and develop a new website showcasing its American-made furniture and fabrics. The new high-tech website features include intuitive navigation menus, and search page, featured products on the homepage, and a dealer locator. Importantly, it serves as a resouce tool for Cox's customers and staff with a protected protal, behind which authorized users can access pertinent information and sales tools. The new Cox website is contains powerful Content Management tools, Search Engine Optimization and is fully responsive for proper performance across all current platforms.